What’s new with hyperuricemia? People say excess uric acid isn’t dangerous. Why wait until it destroys your joints? Get the latest news on hyperuricemia. Hyperuricemia is the medical term for excess uric acid. When you understand hyperuricemia, you understand your gout better. Also, you are better placed to discuss gout with your doctor and other medical professionals. This blog shows my updates and news about the hyperuricemia guidelines. For more information, please see the hyperuricemia guidelines. How many causes of gout exist? 1 = uric acid under-excreters. 2 = uric acid over-producers. 3 = a new cause of gout. Get the facts about three gout causes. High uric acid causes gout. What causes uric acid to rise and fall? Learn the only way to manage gout. Get ways to stop high uric acid, and fix your gout. To understand gout, you must understand uric acid. What are 3 ways uric acid causes gout pain? How can you beat them? Learn why uric acid control is vital. 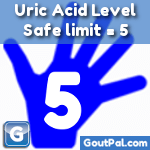 Can you get gout when uric acid is normal? Certainly! See how gout happens despite normal urate. Learn to recognize and control gout without hyperuricemia. 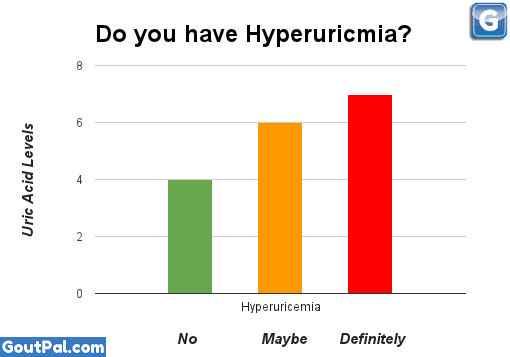 Hyperuricemia means uric acid is too high. But how high is too high? See what happens with high uric acid. Get help to avoid the dangers of hyperuricemia. Can you get gout at 3.5? Gout is personal and each case is different. 3.5 seems too low for gout, but is it really? See why there is confusion about gout.